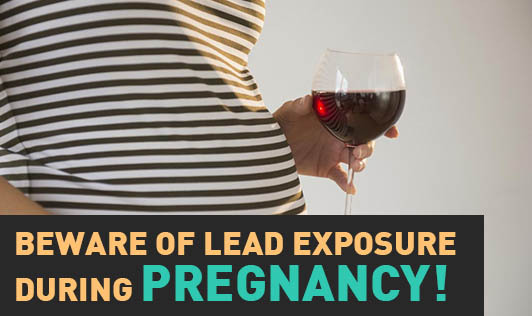 Beware of Lead Exposure During Pregnancy! An unborn baby is at risk, if the pregnant woman was exposed to lead before or during pregnancy. If the pregnant woman has breathed in air contaminated with lead, or swallowed lead, it directly enters the blood stream. Lead from the blood directly passes into the placenta and into the baby's bones and other organs. The situation could get worse if the pregnant woman's diet lacks calcium. At this stage, if she is exposed to lead, her body starts replacing lead in her bones instead of calcium, and this can further affect the baby. Lead exposure affects brain development of the fetus and can also lead to premature births and underweight babies. If lead is detected in the pregnant mother's blood, you can be sure of it being present in the fetus' blood also. It is ideal for pregnant women to talk to their doctor on how to minimize lead levels in the blood and avoid further exposure as well. It is important to identify the source of lead exposure and take precautions to avoid the dangers associated with it. Unfortunately, there are hardly any treatments for pregnant women with elevated lead levels in the blood. A pregnant woman with elevated lead levels should increase dietary intake of calcium, iron and vitamin C, which will reduce the lead levels in her blood and thus the fetus. Various routes of lead contamination into the body include: Lead based paints in your home, eating nonfood items, lead from old water pipes, cigarette smoke and hair dyes. Preventive measures should be taken by your family to avoid lead exposure. Healthy eating is also a good way to curb lead poisoning. Protect yourself and your unborn from this hazardous material to enjoy healthy motherhood!